February 14th, 2010 by KTU | Filed under 4. 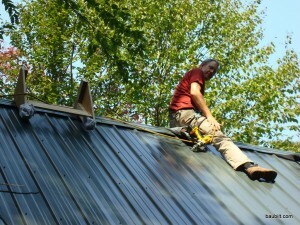 Roofing and Siding. 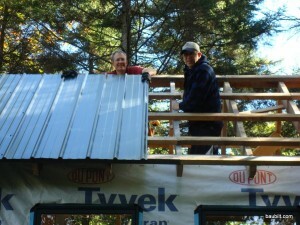 The mini cabin is topped with Fabral painted steel roofing panels. The lumber yard can order this type of roofing in custom colors (Hartford Green in my case). This is a robust, proven roofing solution, and is not very expensive. I’m quite happy with this choice. My father and I ran purlins (rough-sawn 2×4s perpendicular to the rafters) at the eave, at the ridge, aligned with the side walls, and then spaced evenly (at about 22 inches on centers) from the ridge down. We then screwed the roofing down with 2-1/2 inch galvanized roofing screws with heads painted green to match the roofing. (Fabral sells these with the roofing.) We used a conventional drill/driver with a 1/4 inch hex drive to put these in. Next time I’ll use an impact driver. A few hundred screws are required even for a small roof like mine, and many are driven at odd angles. Your wrists will thank you if you use the impact driver. The link here is to the DeWalt unit I own, mostly because I’ve standardized on the 18V lithium battery pack for my tools and chargers. 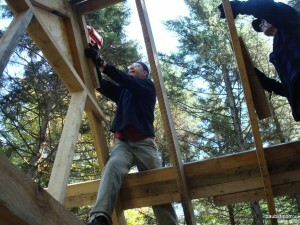 Installing purlins and blocking at end rafters. 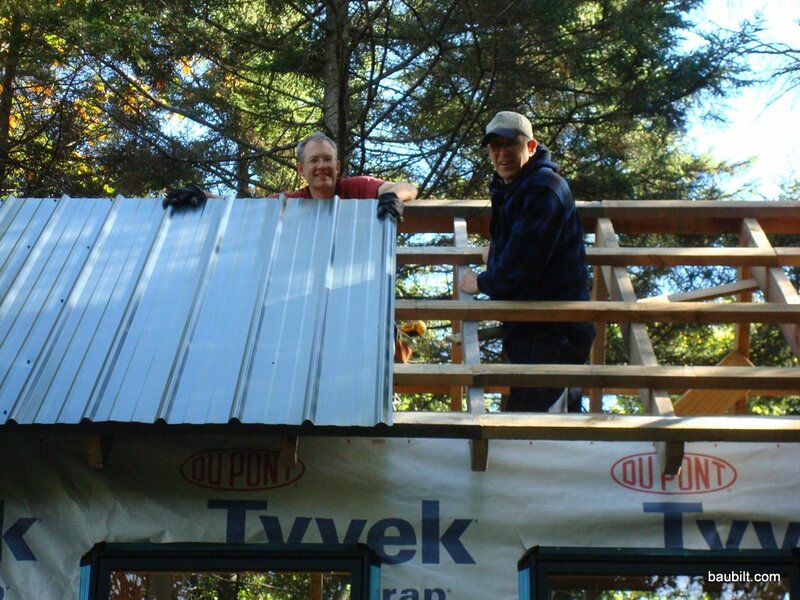 Installing panels over purlins. Pick an order that lets you drive most of the screws with your dominant hand. After installing the panels, all that remains is the ridge cap and the gable-end flashing. I’m going to skip the flashing on the Park City house…won’t do anything 4′ from the wall of the house anyway.